We were completely blown away by the recent Grace Kelly exhibition at the V & A and we're a little sad it's now closed as we would have liked another peek at those gorgeous frocks. If you didn't manage to make it down you're in luck, as we decided to team up with the students of the WFC course at Solent Uni and pick our favourite review of the fantastic exhibition. Congratulations to Kayleigh Richardson, read on to for fantastic review. travelling around Europe after it finishes here on September 26th. I first became aware of Miss Kelly, or as she was known after her marriage to Prince Rainier, Her Serene Highness Princess Grace of Monaco when I first saw the film Rear Window which she starred in with James Stewart – my favourite actor, and thought her to be one of the most beautiful and stylish women I’d ever seen. And was also a little jealous of her having played James Stewart’s love interest! The exhibition is accessible through Room 40, a look at fashion from the 1750’s through to today. 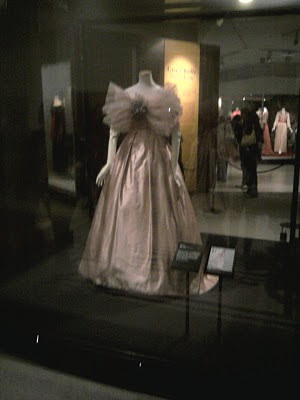 It is fronted by an extravagant, pink, strapless dress which was designed by Maggy Rouff, a Parisian designer and worn by Grace in 1956, the year of her royal wedding in Monaco. For me, the exhibition was more than I could have hoped for. Showing some of the most iconic and memorable pieces worn by Kelly, including a Hermès “Kelly” bag, names after the lady herself as she was so often seen carrying one, to outfits from films such as Rear Window and High Society in which she starred with Frank Sinatra and Bing Crosby. There were some lovely surprises, such as two film projections showing movie and news clips of Grace. And the beautifully insightful labels and photographs which accompany each outfit detailing where and when each astonishingly well preserved piece was worn. The exhibition opened with a private viewing in early April, and was attended by figures such as Joan Collins and Ringo Starr. beautiful! I wish I was in London to see the exhibition. I wouldn't miss it for the world.